Green Mountain Books and Prints opened its doors for business in March of 1977. Ralph and Rosemary Secord had a camp in Sheffield where they spent many summers. In the beginning the store was only open three days a week during the summer months, then the Secord's would head back to Connecticut leaving the store in the hands of Stanley Brill for the winter. Mr. Brill built many of the bookshelves that are still in use today. Prior to opening Green Mountain Books and Prints Ralph Secord was a librarian and ran a business called The Gilead Hill Bookstore. Ralph and his son also toured around the countryside selling remaindered books to schools. Eventually Ralph and Rosemary bought a house in Lyndonville and took on the bookstore as a full time venture. Ellen Secord-Doyle and Jim Doyle would often come to visit them during the summer. When they were in town Ellen would work in the shop for a week or two at a time. In 1980 they decided to make the move and came to live in Sutton. At this time both Ellen and Jim shared working hours in the store with Ralph. Friday afternoons were Jim Doyle's "special" time in the store, eventually he acquired quite a following of friends who would come in to visit and chat, and occasionally close up early and head to Luigi's (a place across the street) for an evening beer! Eventually Jim started teaching English at Lyndon State College. The bookstore grew. Green Mountain Books and Prints began as a used, rare, and remaindered bookstore, now it expanded to carrying new books as well. 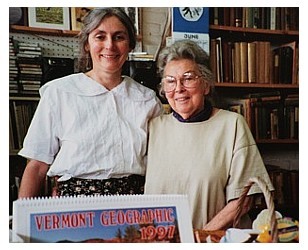 Ellen was always grateful for the advice she received about the new book business from Caroline DeMaio owner of Northern Lights Bookstore in St. Johnsbury. Even though she was creating competition for herself she gave invaluable information and support in this new venture. Now the store had regular hours and was open six days a week. In 1979 Laurel Holmes began keeping the books for the store and in 1984 she and Rachel Desilets began working every other Saturday with Ralph. This continued until 1993 when Ralph Secord passed away at the age of 77. Rosemary began coming to the store full time and she and Ellen continued running the shop with the help of Laurel and Rachel. Rosemary worked in the Children's Room and did the bank deposits. Eventually when Rosemary began working less Ellen's good friend Leslie Gensburg would come in on Wednesday afternoons so Ellen could go and lunch up the street with her mother. Rosemary always supported the store from behind the scenes. She would also often come in and spend afternoons working with Ellen; she is well remembered for sitting in the blue chair in the corner window. In 1997 another change was a foot, Rachel after working at Green Mountain Books and Prints for 13 years was moving. At this time Ellen Doyle hired Kim Crady-Smith to fill the Saturday position. In 2001 Lynn Wurzburg began working on Tuesdays so Ellen could spend more time with her family. Eventually in 2002 Lynn also began working on Fridays. There were many great events at the bookstore over the years. Some highlights include the time Katherine Paterson and her husband came and did an evening reading. It was very crowded and warm in the store, not much space for people to sit. The children crowded around Katherine clutching their worn copies of "Bridge to Terabithia", delighted to be in her presence. One winter afternoon Bernie Sanders was at Green Mountain Books doing a reading from his book "Outsider in the House." He was in the middle of discussing greed and poverty when Santa Claus came barging in to the store. Santa was giving out candy canes at The Darling Inn around the corner. Mr. Sanders was very disconcerted and a bit disgruntled when Santa interrupted him to hand him a candy cane, however, when he found out that the a portion of the proceeds from the signing event were going to a charity, he cheerfully took out his wallet and made a donation. Over the years Green Mountain Books has hosted a variety of local authors including Harriet Fisher, Howard Frank Mosher, David Martin, Galway Kinnell, Paul Lefebvre, Natalie Kinsey-Warnock, Burt Porter, and Julius Lester to mention only a few. Jim Doyle, now an English professor at Lyndon State College became ill and eventually passed away in 2005, following him just a year later Rosemary Secord passed away in the Spring of 2006. It was shortly after this that Ellen Secord-Doyle decided to retire and sell Green Mountain Books and Prints. Kim Crady-Smith after working for Ellen for 10 years offered to buy the store. One June 1, 2007 she became the new owner of Green Mountain Books and Prints. This event was celebrated by a Passing of the Key Ceremony. People came out in droves to see Ellen off into her retirement and to welcome Kim to the community. It was a wonderful event. Green Mountain Books and Prints continues on today, welcoming the community through it's doors and taking pleasure in ensuring that Lyndonville Vermont will always have a place for community to meet to share ideas and the love of books.